A great week for fluffy mail! Oh my goodness. I can't believe my good luck this week. 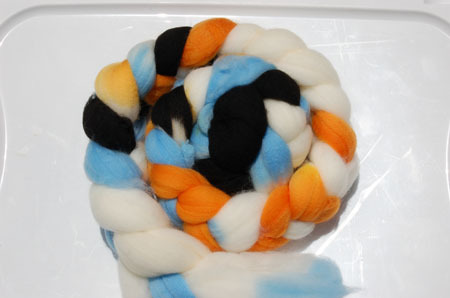 First of all, I have been searching and stalking like a crazy woman for some Wollmeise sock yarn. It has been near impossible to get for some time now and after not trying for awhile I thought maybe the craziness had died down. I was wrong. People in the US were setting alarms at 3am to wait in the off chance it was stocked. 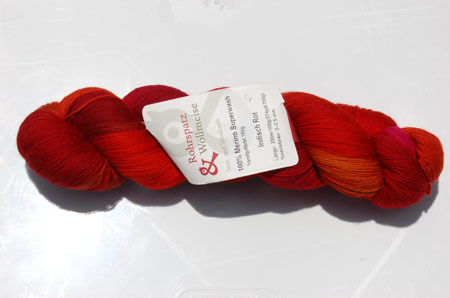 Finally I sent out a plea on Ravelry and wouldn't you know that people who did not want to trade/sell their Wollmeise PMed me saying that they would for me since I'd never tried any! So nice. 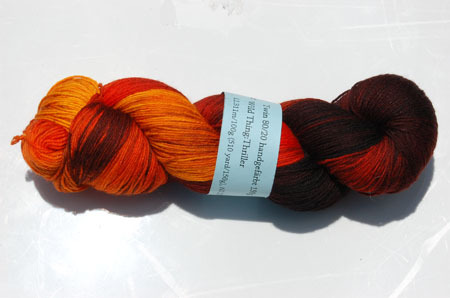 Two skeins arrived this week (from two different Ravelers). Even Mr. Starfish who is unimpressed by most yarn and thinks "stalking" websites for yarn is crazy, has commented twice on the colors in this one! I'm with Mr. Starfish --- that color is spectacular! Can't wait to see the socks. It is incredible. Those reds are to die for. Not good enough for me to wake up at 3 am, but spectacular nonetheless. This page contains a single entry from the blog posted on June 6, 2009 2:14 PM. The previous post in this blog was Baby Boom. The next post in this blog is Obsessed?.